ChainLink Research : Research :What Will It Take? 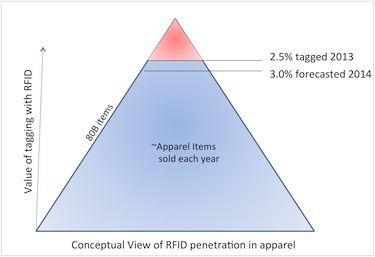 Passive RFID sales are being dominated by apparel. 2014 will see more apparel items tagged. But for a sustaining market, RFID will have to make the case in other categories and other industries. There is no argument today about the impact that retail/apparel and footwear have had on the passive UHF market. Estimates vary on apparel’s share, but it hovers around 70% to 80% of the total UHF market. And that includes only about 2% of the apparel items sold. In our recent research of RFID use among retailers, the retailers indicated an interest in expanding their use of RFID in apparel. And the tag industry that supports retailers is forecasting numbers between 23% to 35% growth in apparel use, as well. (See side Figure 1.) More retailers will be tagging more items in the next few years. More, however, does not mean all. Leading retailers who have a lot of expertise in RFID may be looking to tag more items in the store, but most retailers are only focused on certain value propositions and use cases such as high margin, high mix (blue jeans, men’s shirts) and hard to keep in stock/NOOS (never-out-of-stock) items. If you look at Figure 2—a conceptual view of retail consumer items—you can see the share that apparel has of the total goods sold and the current share of tagged items in retail overall. Out of the potential trillions of items that get sold every year, estimates were tagged only 3B or 4B in 2013.1 That indicates—if you are an optimist—market growth and an exciting future for ‘tagging the world.’ If you are a pessimist, that is a puny number and it may appear that RFID will never attain the penetration needed for long-term rewards. Realistically, though, RFID could be used in significantly more categories of consumer items. Retail use cases, such as the goal of solving inventory and customer-experience challenges, exist across all merchandise offerings. Forecasted growth of UHF RFID, overall, ranges from 10% to 35%. If you look at Figure 2, which is designed to represent retail share of UHF, you realize that depending on retail apparel alone won’t get us to a sustained profitable market for the chip and other product providers. We also need other categories to attain the same mass market characteristics as apparel in order to really see a market of size. What Is the Mass Market for UHF? Since ~2003 the industry has been crafting, molding, designing, and learning what to tag and how to tag it. Two happy events converged—a lower-cost design and a credible value proposition for a high volume use case. Mass market characteristics in this sense mean that we can easily produce a reliable low-cost tag that can predictably be read in many environments without too much finessing. That is, an end-user with little to no training can install the technology and expect it to work. The item can be sent around the world and the tag can still be counted on to be readable. Additionally for RFID, the process is easy and cost affordable to instrument. We can rely on other entities—trading partners, service providers—to be able to install readers and read tags with similar or the same performance. For mass market, we also need enough implementation expertise to address many opportunities. This expertise can ensure that use cases are fully implemented and deliver a reasonable time to benefits—within a year from when the investment is made (although most users would like to see benefits in under that time frame). Simply stated: price/performance! Apparel turned out to be a wonderful launching category for UHF due to the physical characteristics of the goods, how they are displayed, the high sales rate and the challenges and high costs of inventory management. Although from 2003-2005 all the talk was about supply chain and shrinkage, an even more attractive benefit was uncovered—sales uplift. This was something senior executives could get excited about. Thus a mass market had arrived. Now we just need more of those. A lot more. What Has to Happen for Other Categories to Grow? What has to happen to get a few more markets to go pop? We need more happy confluences of high-value use cases and price performing predictable tags. The world of things is a pretty big place. And some things are just more interesting than others. Trillions of items for sale. Trillions of items to track. For a decade, the industry has been coaxing out the things that may have that happy confluence. 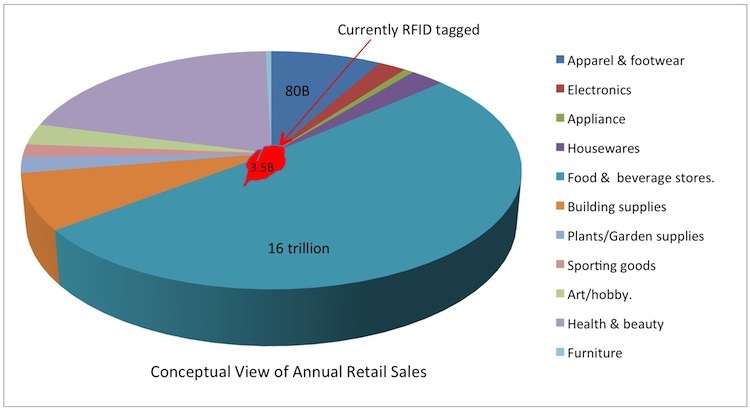 Yet these markets—cold/perishables, pharmaceuticals, electronics, equipment, maintained parts, etc., currently represent the low-end growth of the RFID market—10% to 15% (that is of the smaller base of ~1B tags, currently). It’s not that these things or the use cases surrounding them—anti-counterfeiting, product protection, or inventory management—aren’t important. It’s just that the price performance issues are not yet solved. And that is an admission by many of the tag producers. Yes, we do have tags and readers that work. But they don’t meet the same mass market tests that the apparel tags do. It is more difficult to attain low cost, decent reads on materials that have different properties than apparel. Metal, liquids, and tough environments are still challenging and require different antennas; some require different software to tune to conditions of heat and cold. The tags also need a highly economical production process such as the current label rolls that are easy to produce and easy to apply. Low production costs mean low tag costs. Right now we are seeing an increase in jewelry tagging—some pilots and rollouts. Jewelry has some of the value proposition for retailers that apparel has—stocking, location, and shrinkage. Consumer electronics could be another category. Yet both of these have physical property characteristics that required a new tag design. These new tags are arriving into the market. We will see how well they are adopted within the next year or two. For other categories, the current generation of tags work, but they may not have that extra edge—price and predictability. 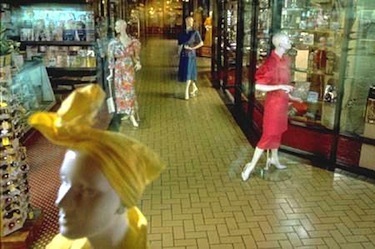 Think about what it took for UHF to go pop in retail. In the early days, the supply chain story was supposed to make the market take off. Instead, it fizzled.2 However, when retail executives saw sales uplift, they signed on. Demonstratable sales uplift, measurable cost decreases, or other productivity gains are critical to win approval for these programs. The discovery of these powerful use cases is not only an industry issue, but also a company case-by-case process. For supply chain/supplier tagging to take off, the value proposition has to be theirs—not their customers’ or RFID tag manufacturers’—to succeed. While talking to some of the RFID product producers, I hear them state that the “value proposition is good, so pricing is not the issue.” Is that so? If it were, we would already have a market of tens of billions. Imagine the impact on an industry or the economy if many, many billions of things were tagged at current tag prices.3 The cost of products would go up by between 10¢ to $1 per item4 in consumer and $5 to $40 in equipment. My math may be a little off, but not by much. Hence, the value proposition has to be super valuable to endure that impact. Or the price has to come down some more. Any young marketing student knows about price elasticity: many items to tag can mean a big market if you can scale and should mean significantly lower costs per tag. We’ll need that lower cost to win those projects. There are a lot of projects out there with value propositions, but executives can pick only a few to implement. And they are still not picking RFID as much as we would like. The economics have to be there. Producers can help. Keeping up the design and development, and having another price/design breakthrough could mean the difference. In our next segment we will begin to roll out our current market research on Passive RFID. For more on RFID, see our RFID collection. Attend the annual MIT RFID Expo on May 7th 2014.